Liner Notes: HARUM SCARUM In 1983, four Youngstown, Ohio area musicians joined to form a band to record a few songs in a basement to a 4-Track. In less than one year, they were in a 24-Track studio recording their self-titled full length LP. The progressive rock of the 70’s and early 80’s heavy metal influenced HARUM SCARUM’s music style. From the progressive On The Run, to the Zeppish LiZ, to the Floyd-like Rounded Wall, the sounds of guitar, bass and drums are evidence of this era. The album was a concept album focusing on the Grey-haired Man. A man who was part of a community striving for good amongst all the evil in the land. 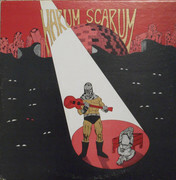 HARUM SCARUM had 1000 albums pressed independently on their own Teridackle Records and distributed them to music stores throughout Cleveland, Pittsburgh and Youngstown. Eventually, some became available overseas. Now considered collectable, these hard-to-find records are now selling for as high as $60 a piece. After two years, HARUM SCARUM quietly disbanded in 1985 with most of it's members venturing off in new musical directions. Finally, after 25 years, the original recordings have been re-mastered digitally. Although their albums are long gone, their music is once again available thanks to mysteries the Grey-haired Man never dreamed of. Отправил на Ютуб просьбу поделиться альбомом. The demo is a different band. got it finally, not bad, bit weird but solid, typical private release.